Today I get to introduce a theme that I've been working on for a while now. It is one of those projects that has gone through a lot of different iterations. 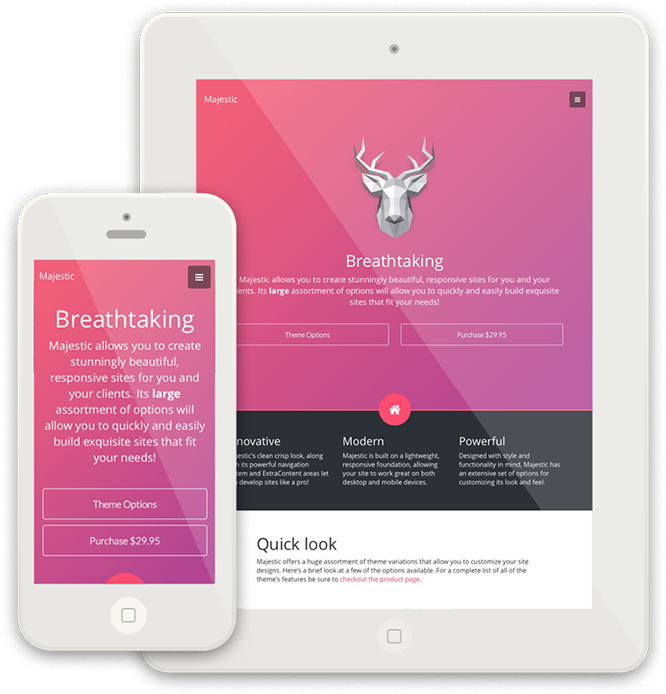 Majestic started as a much simpler theme and grew along the way to become a very feature-rich template. In fact at one point I stopped work on another theme I was building and merged many of its big features into this theme. Beta testers can attest to the fact that this theme alone must have gone through at least 4 different navigation layout and designs before settling on this particular setup. All of this work really ended up making Majestic a beautiful, and very versatile theme. It allows you to build stunning, cleanly designed pages and customize the heck out of them using the built-in theme variations. Creating blogs, portfolios, small business sites and more is as simple as pie with the Majestic theme. Has a versatile navigation system that allows for a great deal of parent and child pages, as well as features smooth animations. Includes our Blog Entry Topper feature. These are but just a few of the many features included in Majestic. You really have to give it a look to appreciate how versatile this theme really is. Checkout the live preview site, as well as watch through the tutorial videos on the product page. These will help you get a feel for what Majestic can do for you.